In what I can only call "a crisis of faith", I have made the trend known as "dessert hummus" and found it to be very pleasing. When it was first (gently) suggested I explore dessert hummus by my (sweet and understanding) editor, I demanded a phone call, so alarmed by the concept was I. The key, we decided, was respecting the chickpea. Instead of smothering them with chocolate powder to make an uncanny valley brownie batter, or mixing them with M&M's to make not-quite-cookie-dough, one needed to treat them just as they would any other plant part that straddles the realms of sweet and savoury. I wouldn't put chocolate powder or M&M's on roasted sweet potatoes, but I would drizzle them with maple, and bathe them in brown butter. This is the tack I took with my sweet hummus, and I am now traumatised by how much I like this starchy, nutty, sweet spread. 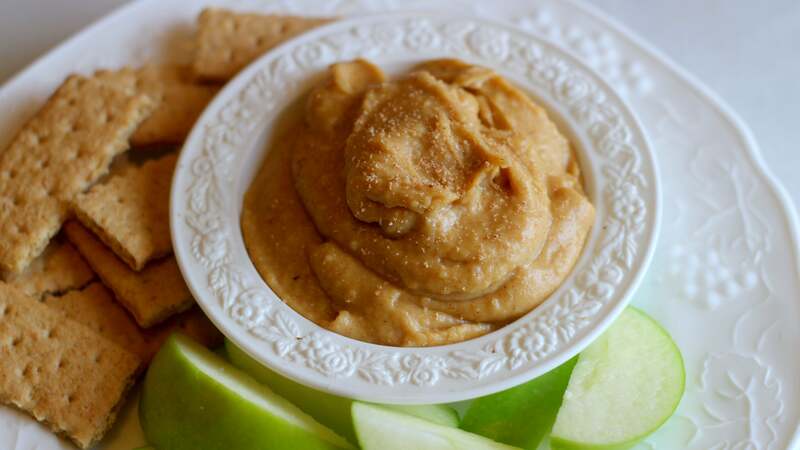 Add the chickpeas, tahini and maple syrup to a food processor and pulse until well combined. Cook your butter in a pan over medium heat until it turns a light brown colour and smells nice and nutty. Turn the food processor on, and drizzle in the butter as it's running. Turn the food processor off, scrape the sides and bottom of the bowl, and add the remaining ingredients. Process until smooth, and serve with fruit, pretzels, rice cakes (if you are into that), or anything that would be good with peanut butter. Take a bite, enjoy your sweet hummus, and come join me in this brave new world.